This unusual Defender prototype turned up in the collection of Jerry Lawson (founder of Video Soft) and has a few interesting oddities. 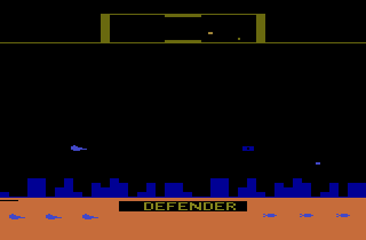 The first oddity is that it shows the name DEFENDER in the copyright box at the bottom of the screen instead of the standard © 1982 Atari text. This is unusual because Atari games did not start displaying their names on the starting screen until title screens became the standard practice in late 1983/early 1984. The other interesting difference is that Bob Polaro’s hidden initials (triggered by carrying a human to the 25th line of resolution on your TV on the 25th wave) have been changed HA. It is not known whose initials these are, but they could be a friend of Jerry's or could simply be short for HaHa. Given the nature of these changes it’s possible that this is a hack rather than a true prototype.